Skwooshi is a compound unlike anything else, it is moldable one minute and flows the next! Never dries out, Never makes a mess. Makes incredible detailed sculpts. Gluten and Wheat free. Stays crushable, Skwooshable and start all over again…. Please note: This is an assortment pack. 1 will be supplied and picked at random. Colours and decorations may vary. Skwooshi is a compound unlike anything else, it is moldable one minute and flows the next! It never dries out and never makes a mess. With the Skwooshi Activity Set you can make incredible detailed sculpts. Gluten and Wheat free. Stays crushable and Skwooshable so you can easily start all over again. 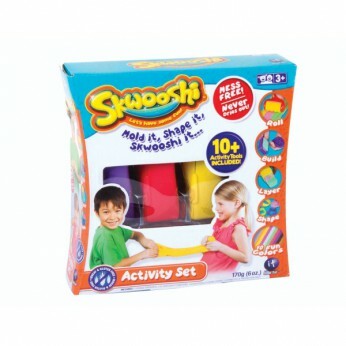 For ages 3 and above.Unleash your creativity with the Skwooshi Activity Pack. Skwooshi is a cool modelling dough that never dries out and doesn’t make a mess. Use the ten activity tools to cut, roll and squish it into all sorts of shapes. Then when you’re finished, store the Skwooshi in the handy cases. This fantastic set includes: 3 storage containers 4 activity tools 4 shape cutters 1 cutting tool 2oz yellow Skwooshi 20z purple Skwooshi 2oz red Skwooshi It’s wheat free and suitable for kids aged three and up. This toy costs approximately £12.99 (for the latest and best prices make sure you check our retailer list for the Skwooshi Activity Set above). In our review of Skwooshi Activity Set we classed it as being suitable for ages 3 years, 4 years, 5 years but recommend you check the manufacturer specific advice before purchasing.